The top two in the Advanced division remained unchanged today at Millbrook Horse Trials, with Boyd Martin and Long Island T still leading on 22.9 and Sara Kozumplik Murphy and Rubens D’Ysieux still in second on 23.4. 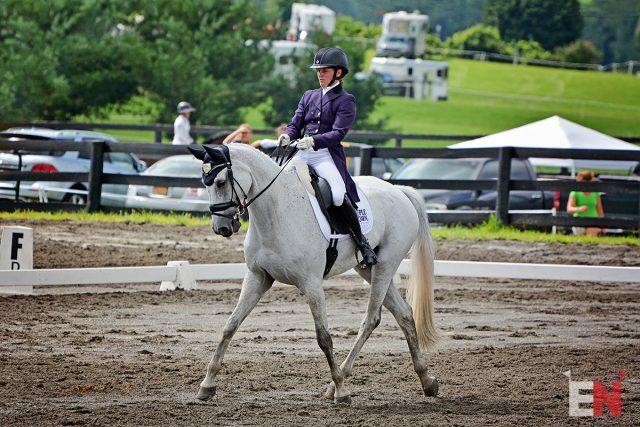 Click here to read Boyd and Sara’s thoughts on their tests in yesterday’s dressage report. Allison Springer and Lord Willing delivered the best test of day two to slot into third place on 25.0, a personal best score for this pair at the level. We have seen epic thunderstorms over the past three days here at Millbrook, and Allison had dry conditions for the first half of her test but finished it in a total downpour. “Liam,” a 9-year-old Holsteiner (Lord Z X Legende IX, by Coriano) owned by the Lord Willing Syndicate, always presents a beautiful picture in dressage, and Allison said the key to achieving that relaxation is letting him get out all of his bucks, kicks and crow hops on the lunge line prior to the test. Liam stepped up to the Advanced level at Pine Top in February and has had patchy form throughout the spring season, finishing fourth at Jersey Fresh CIC3* but retiring on cross country at Great Meadow CICO3*. Allison said she will be looking to give him a steady, confidence-boosting ride tomorrow. Emily Beshear and Jennifer Ward’s Olney Uncle Sam delivered a personal best and cracked into the 20s for the first time at Advanced level, scoring 25.7 to round out the top five. Three cheers for American-breds — “Sam,” an 11-year-old Trakehner (Sonset Seiger X Aerial, by Starman), was bred in Maryland by Ami Howard. Cornelia Dorr and her own Louis M, a 13-year-old Rheinlander (Lissabon X Angelique M, by Abanos), scored 28.4 to tie for equal sixth place with Buck Davidson and Park Trader, a 16-year-old Irish Sport Horse (Master Imp X Ballyhast Polly, by Highland King) owned by Carl and Cassie Segal. Boyd Martin has three horses in the top after dressage. 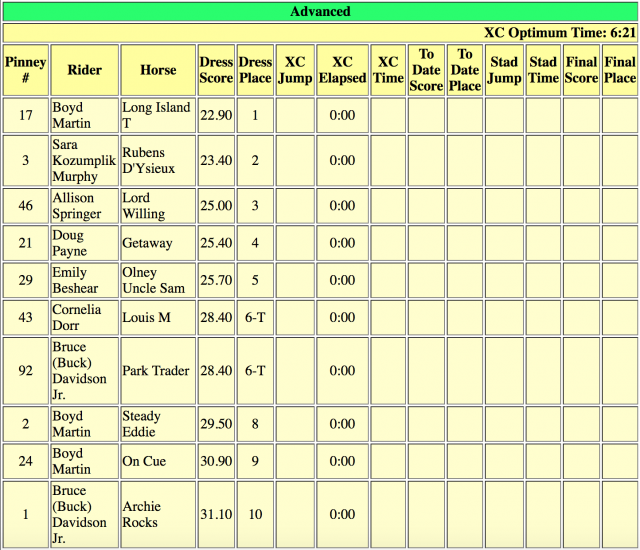 In addition to leading with Long Island T, he also has Steady Eddie in eighth place on 29.5. “Eddie,” 15-year-old New Zealand Thoroughbred (Jetball X Tudnela) owned by George and Gretchen Wintersteen and Denise Lahey and Pierre Colin, delivered the fastest cross country round in the Advanced division at Millbrook last year, so he is one to watch tomorrow. Christine Turner’s On Cue, a 12-year-old Anglo European mare (Cabri d’Elle X On High, by Primitive Rising), won the Jersey Fresh CCI2* with Boyd and is making her Advanced debut at Millbrook. She sits ninth after dressage on 30.9. Buck Davidson also has another horse in the top 10 in Maya Simmons’s Archie Rocks, a 10-year-old Thoroughbred (Le Monde X Unbridled Diva, by Unbridled Jet) who scored 31.1 to round out the top 10. Click here for full scores at the conclusion of dressage. 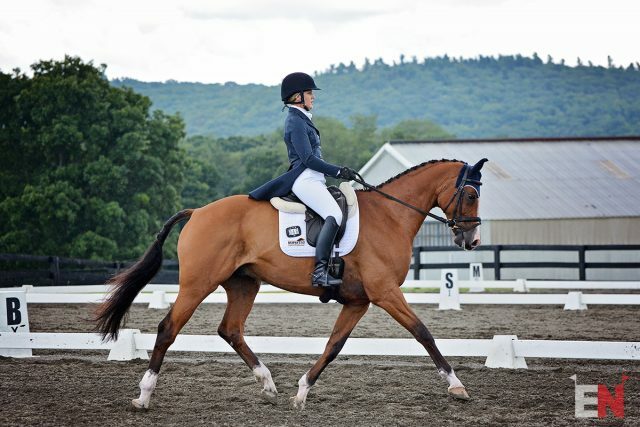 We saw personal best dressage scores for all of the pairs in the top five of the Advanced division. EN’s data analyst Maggie Deatrick crunched the numbers on dressage, and scoring in the Advanced was 2.82 marks below the expected averages for these combinations. Yesterday Bobby Stevenson marked 2.61 marks below the expected averages, and today he marked 3.08 marks below the expected averages. Looking to the Intermediate divisions, Phillip Dutton has his U.S. World Equestrian Games team mount Z and reserve horse I’m Sew Ready running in the Open B division. Both horses delivered fabulous tests today under the watchful eye of Phillip’s dressage coach Scott Hassler and U.S. team coach Erik Duvander. I’m Sew Ready, owned by John and Kristine Norton, leads on 25.2, with The Z Partnership’s Z tied for second place on 27.1 with Jenny Caras and her own Fernhill Fortitude. Doug Payne and Susan Drillock’s Quantum Leap lead the Open Intermediate A division on 27.5. 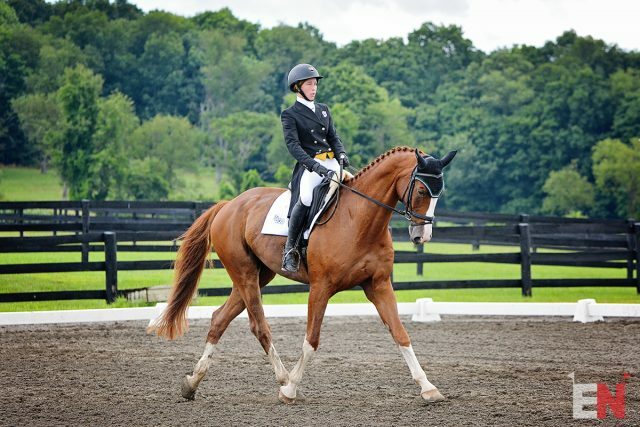 We are delighted to share the good news that “Quantum,” a 7-year-old Holsteiner (Quite Capitol X Report to Sloopy, by Corporate Report) bred in Maryland by Elizabeth Callahan, will be heading to France to represent the U.S. in the FEI World World Breeding Eventing Championships for Young Horses at Le Lion d’Angers. Looking ahead to tomorrow, we are in for a wet and wild day of cross country. A massive storm rolled through the area this afternoon, and more rain is predicted to fall tonight and into tomorrow. Click here for a fence-by-fence preview of Tremaine Cooper’s Advanced course, which has a new look this year. Only 20 seconds separate the top 10 in the Advanced division. With muddy conditions on tap and a hilly course that always makes the time tough to catch at Millbrook, we can expect time penalties to rack up and the leaderboard to look very different after cross country. Advanced cross country is set to start at 10:30 a.m. EST tomorrow morning. There is no live stream, but EN will be running live updates. Keep it locked here for all the latest news from Millbrook. Go Eventing.